HomeAlternative Medicine ProductsMaca Extract 12:1-60 675mg VegiCaps – Stearate Free, Bottled in Glass! FREE SHIPPING on orders over $49! Maca Has Been Traditionally Used To Enhance Fertility and To Improve Memory! 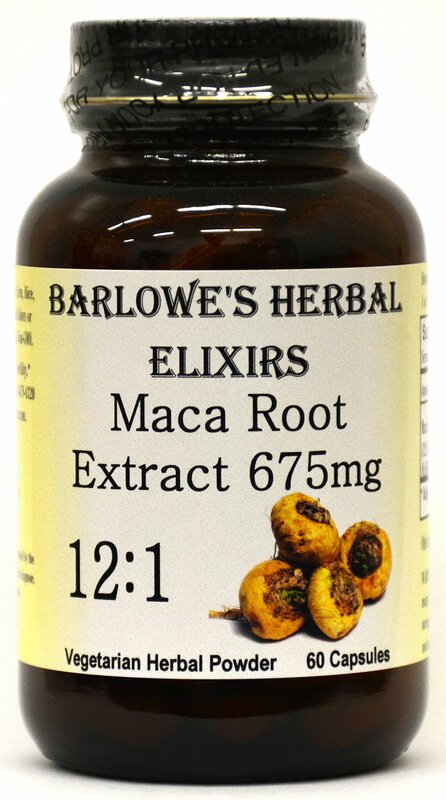 Barlowe’s Herbal Elixirs proudly offers a potent 12:1 Maca Extract. 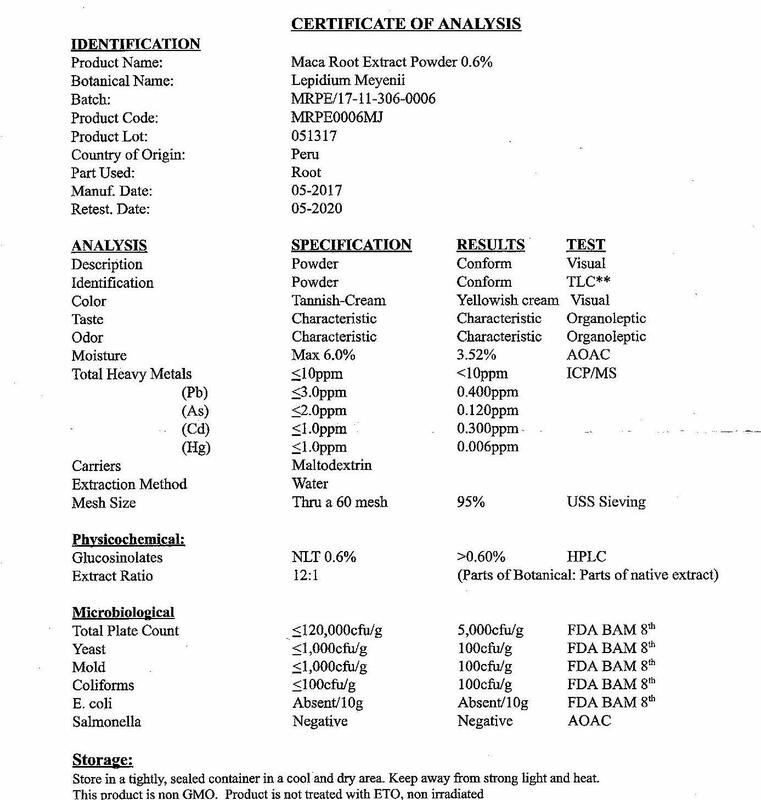 The Maca Certificate of Analysis (COA) of this particular batch is shown above. Maca (Lepidium meyenii) has been cultivated in the Andes Mountains for several centuries. The plant grows at very high altitudes, between 11,000 and 14,000 feet, which scientists believe is critical to the plant’s unique nutrient and alkaloid content. Traditionally, Maca has been used to enhance fertility in people and animals, to improve memory and energy, and for other medicinal purposes. Due to its proclaimed anabolic properties, Maca is oftentimes referred to as “Peruvian Ginseng.” ***These vegetable-derived capsules (Vegan, Kosher and Halal certified) are filled on slow speed equipment and only pure, unadulterated herbal extract is contained in the capsules. There are no magnesium stearates, fillers, gelatin, silicates, gluten, corn, wheat, rice, yeast, starch, titanium dioxide, artificial colors, artificial flavors or preservatives. Capsules produced with high speed equipment in herbal and dietary supplement “factories” generally contain several other ingredients, including powdered lubricants called STEARATES (which can greatly diminish an herb or supplement’s absorption into the body). Check their labels! Barlowe also still bottles his products in glass as he believes chemical vapors can vent from plastic containers and contaminate the contents and that glass is better for the environment. Barlowe’s Products Can Ship Together At One Low Combined Rate! FREE SHIPPING on orders over $49! 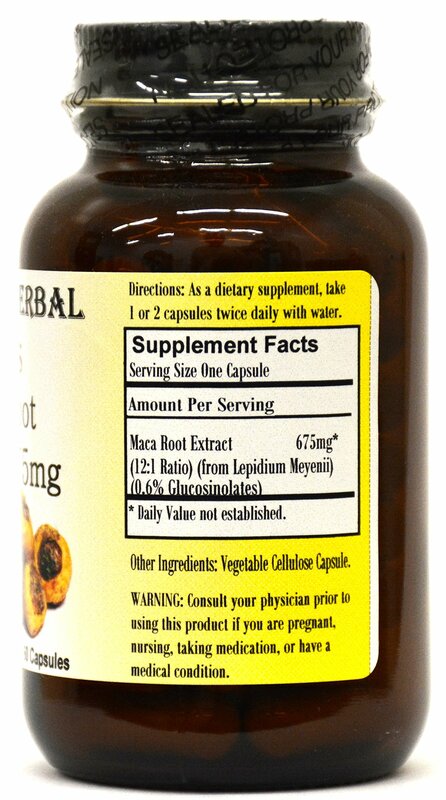 Specification: Maca Extract 12:1-60 675mg VegiCaps – Stearate Free, Bottled in Glass! FREE SHIPPING on orders over $49!